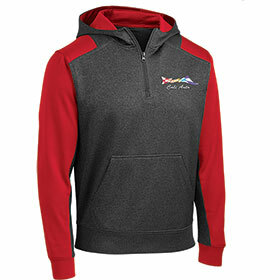 Colorblock ¼ Zip by Sport-Tek® Comfortable yet professional, this sweatshirt features colorblocking on the hood, shoulders and arms. 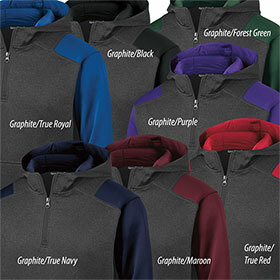 The rich, heather colored mid-section has a ¼ zip and front pouch pockets. This sweatshirt is a perfect laying item with it's full athletic cut. Rib knit cuffs & hem Sizes: XS - 4XL (Add $2.00 Ea. for 2XL, $3.00 Ea. for 3XL, $4.00 Ea. for 4XL) The more you order the more you save!